Any member participating in a meeting may vote at any of the above meetings by a show of hands or by electronic means. All motions requiring a vote, including nominations for Directors will be provided to all members 30 days in advance of the meeting either by electronic means or by mail. Units will consolidate returns and pass to the Regional HQ. Regional HQs will consolidate unit returns and forward to the Board Secretary. If a secret ballot is required e.g. when members nominated for the Board are not elected by acclamation, the following procedure will be used. The Secretary will distribute ballots to Units by electronic means; Units will print ballots and distribute by hand or by mail. Ballots will be returned to the Unit by hand or by mail. Units will seal all ballots in a single envelope and send to the Board Secretary. The Secretary will arrange for the ballots to be tabulated by two members of the organization who are not involved in the balloting. Motions requiring a vote will be provided to Regional Directors at least 30 days in advance of the meeting, members will vote by a show of hands or electronic means. If a secret ballot is requested by the majority of members attending whether in person or by electronic means. Ballots will be provided by electronic means to Regional Directors who will return them by mail to the Secretary as soon as possible. The Secretary will arrange for two members not involved in the ballot to tabulate the results. All votes will be by a show of hands or electronic means unless a secret ballot is requested. If one is required the Regional Chiefs through the National Unit Secretary will prepare the ballots and arrange for them to be mailed to members not present and on their return, their tabulation by two members not involved in the motion that required the ballot. Electronic voting at the unit level will be at the discretion of the unit executive. Proxy voting will be instituted if the HQ Executive determines that it is appropriate. 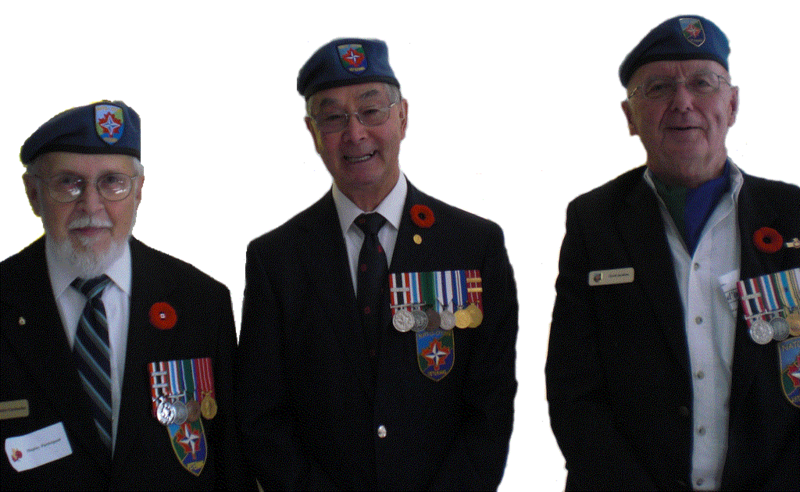 It is the policy of NVOC to standardize the "walking out" dress for the membership of the NATO Veterans Organization of Canada, to provide guidance and direction to NVOC members in their bearing and deportment and in representing NVOC in such a manner as to reflect credit on NVOC and to assist NVOC in creating a respectful image of a NATO veteran organization that stands-alone from other veterans organizations, associations or group affiliations. NVOC is a distinct, unique and separate national veteran’s organization and thus its membership should apply and comply with these dress regulations in order that they are not confused with other veterans. The NVOC tie or any unit, ship, squadron, regimental, tie (other than that of another veteran’s organization, association or group affiliation) may be worn. Navy blue, single or double-breasted with a large NVOC embroidered badge that is worn on the left breast pocket. Buttons may be from any former regimental, unit or service affiliation or CF. Only nationally issued honours, awards and decorations may be worn. Those include CF and foreign-awarded hazardous skill insignia such as aircrew and parachute wings, ATO, EOD, Ships and Clearance Divers badges etc. Medals may be worn in either standard or miniature sizes. Only nationally awarded lapel pins may be worn. Poppies, if worn, will be worn on the left breast lapel above medals. This order of dress will consist of short sleeve white shirt (naval or commissionaires style) with the NVOC crest embroidered or NATO crest sewn over the right breast pocket ½ inch above the top of the pocket. Epaulets will be air force blue with NVOC embroidered on them in gold letters 3/8th inches in height at outside edge. The remainder of dress will be the same as Formal Waking Out or Parade Dress. Ribbons will be worn over the left breast pocket and nationally awarded honours above the ribbons. NVOC name tags will be worn over the right breast pocket. The wearing of shirt sleeve order will be at the discretion of the senior member. NVOC members are encouraged to wear and display all approved NVOC insignia on their casual walking out dress such as wearing the NVOC lapel pin on their civilian suit left collar, the NVOC embroidered badge on sports clothing, baseball caps or to display the approved NVOC decal on their personal vehicles. The NVOC KIT SHOP is managed by DROUIN ENTERPRISES on behalf of NVOC sharing revenues from sales. It is located at: http://www.joedrouin.com .